I’ve written before about minor traumatic brain injuries (28 November 2012). In my practice I’m continuing to see more patients who have had mild to severe brain injuries. For this reason, I’ve recently completed a post-graduate course in treating traumatic and toxic brain injuries. In osteopathic terms, these injuries are called Endocranial Spasms. These are injuries, whether physical or chemical, that affect brain function. Because they affect brain function they have an overall effect on a person’s ability to live. For example, injury to a specific part of the temporal lobe of the brain (at the side of the head), can result in problems with short term memory and learning. Or the effect may be more emotional, with a greater likelihood of ‘flying off the handle’. TBI’s (traumatic brain injury) can also affect a person’t mobility if the motor area of the brain is affected. 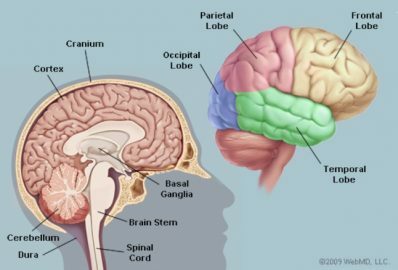 The brain sits in it’s container – the cranium, and is generally well-protected. However, blows to the head, or violent movement (eg. whiplash) can cause bleeding or bruising in the brain. This in turn can cause an area of the brain, whether very small or large, to stop working or ‘living’ like the rest. This is the endocranial spasm. If there is a history of a number of injuries then there will likely be a number of endocranial spasms in the brain. Untreated, these spasms can cause immediate symptoms, such as dizziness, or possibly make someone predisposed to developing mental deficiencies when older, such as dementia. Many people go untreated for endocranial spasms because their symptoms appear to resolve, only to find that, as they age, symptoms may reappear. This is because, as we age, our brains are less able to cope with and compensate for, the effects of past injuries. Preparation for, and treatment of, endocranial spasms involves treating the whole body. This is to make sure that every part of the body, especially the nervous system, is at its best to aid optimal healing. For example, there may be issues in the upper back and neck that will prevent optimal healing by impeding blood flow to and from the brain. This is the reason why these areas, and the spine as a whole, are treated first. Then the bones of the cranium and specific structures within it are treated. Each treatment improves the patient’s well being so beneficial results don’t just happen when the endocranial spasm is treated! The treatment of endocranial spasms can change a person’s life: from living with reduced body and brain function to enjoying an increased capacity for life.